Memorial Day weighs heavily on the hearts of veterans and service members. We all know someone, or all too often, MANY…who have fallen in service of our nation. Memorial Day weighs even more heavily on the parents, spouses, children and family of those same men and women. It’s a solemn day for them. A day in which most of us go about our business trying to enjoy the very same things the aforementioned can not fully embrace. They attend the barbecues, picnics and parades, but someone is missing. Someone is always missing for them. Take a moment today, to quietly remember the fallen and their families. I decided to start Memorial Day with two things. First, I just donated $100 to producer Tracee Beebe’s film The Unremembered. She’s tackling a difficult subject affecting Vietnam Veterans, one of whom is her father. The Unremembered is a dedicated effort to bring attention to thousands of veterans that have been denied the benefits they deserve, and their friends died to preserve. Consider making a donation and bringing their plight into the open. Link to The Unremembered. Second, I decided once again to coordinate a charity campaign with the launch of my next book, Black Flagged Vektor. Previous campaigns raised a total of $7000 for organizations like the DAV and Wounded Warriors Project. I will continue to support the Wounded Warriors Project with my upcoming launch. My goal for this charity campaign is $2000, which will yield $4000 through a corporate match. As always, spread the word. The pictures below were taken during a recent trip to my alma mater, the United States Naval Academy. 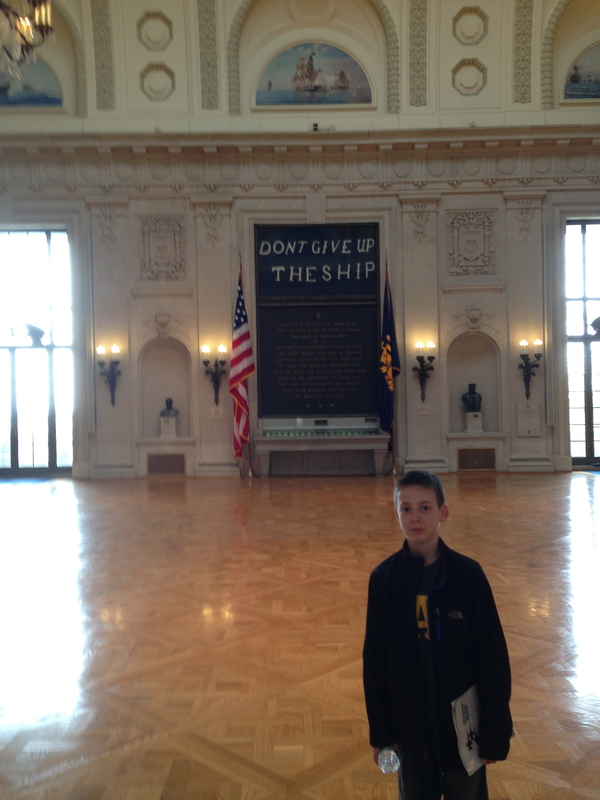 The first picture shows my son, Matthew, standing at the entrance to Memorial Hall. The second gives a more panoramic view of the space. Memorial Hall is dedicated to all of the Naval Academy graduates who have fallen in the line of duty. There are many. Thanks, Lisa. Hope you guys are doing well. We should catch up soon. It’s been a while. Thanks, Harry. I try to throw all three at an issue, hoping that at least one works. Thank you, Steven. I had served with Co B, 1/12th Inf Rgt, 2nd Bn, 4th Inf. Div, Pleiku, 68-69. You are right: these days are heavy. My battalion lost all its officers (KIA, MIA) 5/29-5/31, 1969. Our CO was in the June 69 issue of Life Mag: Col. Robert Carter. He is one of the many who died during those days. I think the article was entitled, “One Week’s Dead”. I enjoy your novels. Thank you for your excellent education, and USN service. I can’t imagine, Joseph. Very heavy indeed. I think most of us (younger generations) have forgotten the extreme level of casualties common to war through Vietnam. Not that today’s warfare isn’t a devastating affair, but the scope is different. I can’t imagine a scenario today where an entire battalion could lose all of its officers in a three day period. Casualties beyond the officers must have been horrible. We all salute you and those that served alongside you. In my mind, you’ll never be forgotten. I found the link to the Life Magazine article. Chilling.